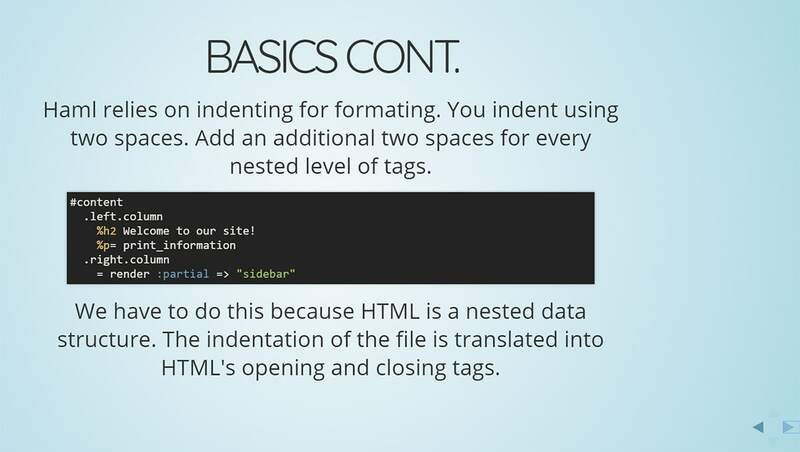 Basic HTML is pretty simple to learn. It’s also the cornerstone of all websites and it’s a necessity for web developers of all styles. But modern preprocessors let developers write shorthand HTML to save time. One of my favorites is the Haml language running on Ruby. It can work as a Ruby templating language and it can work as a preprocessor for basic HTML sites. 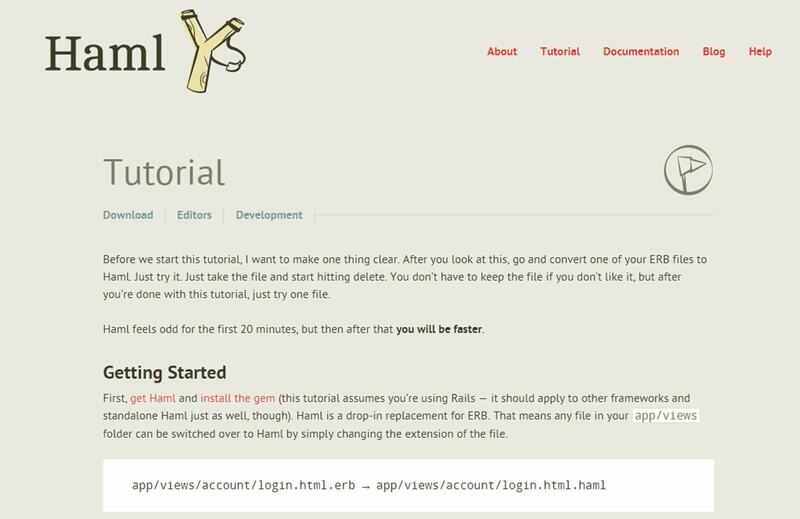 If you’ve ever wanted to learn Haml from scratch then this guide has everything you need to get started. The easiest way to learn anything is with free tutorials. You’ll find dozens of these all around the web and they come in different levels from beginner to advanced. I’ve actually found the main Haml tutorial really useful for beginners. The writing style is simple and it covers the Haml language from start to finish. This includes a clear setup guide, a process for customizing your HTML code, and a process for optimizing your new Haml workflow. There’s so many little tricks of the trade you’ll learn as you start to add Haml into your projects. But these require real world practice and it’s best to start with the basics first. I’m fond of the SitePoint guide too since it covers Haml’s basic features and setup materials for newbies. Another fantastic guide is this one hosted on GitHub, although it’s a bit shorter than most. It’s meant to be a short yet sweet beginner’s guide to Haml. It runs in a slideshow format where you move between slides and pick up tidbits along the way. You can use this as a recap for the basics of Haml, or to just go over the fundamentals in an easy-to-digest manner. But the real technical stuff is out there on tutorial blogs. My favorite is TutsPlus and this guide is perhaps the best for advancing your knowledge. It teaches Haml + Sinatra which both work over Ruby, so you’ll want to be familiar with at least the absolute basics of Ruby. But you don’t need to know how to build Ruby apps to run Haml. I actually recommend browsing through the Haml category to scout other relevant tutorials. You’d be surprised how much you can learn from following just a couple posts. YouTube is probably the best resource for visual learners. It offers a massive library of free materials created by people all over the world. You can find videos in many languages as well, making YouTube the perfect place for everyone worldwide to learn by watching. Both come from the Screencasts YouTube channel and while these are fairly old videos, the materials are pretty much on point. They’re both short intro videos but they should cover almost everything you need to get started. If you already know your way around some basic Haml but wanna push forward and really make the switch, this video might be more appropriate. It’s about 10 minutes of switching over to Haml from default HTML. Might seem a little boring at first but it’s a solid video for professional web developers. If you search through YouTube you can find a ton of Haml tutorials. But the more experienced ones aren’t going to just cover Haml. They’ll teach you how to make a webapp using Haml+Ruby, or how to compile a full template using Haml. If you’re willing to spend a bit of money on learning materials then you can find some great stuff out there. Haml isn’t often covered in detail with premium resources, and it’s usually lumped together with other stuff. But if you search around you can find large premium courses that’ll take you from start to finish with Haml, Ruby, and the entire workflow. The online learning resource Pluralsight offers a great course on >Haml & Sass. It’s pretty short totaling just about an hour, but it’s also highly rated and one of the few courses really getting into detail about this frontend combo. Note it is quite a few years old, almost pushing a decade actually. Yet I still recommend it because the fundamentals rarely change with these types of preprocessors. Newer versions may add functions or simplify the syntax, but starting from the basics you can learn pretty much anything. 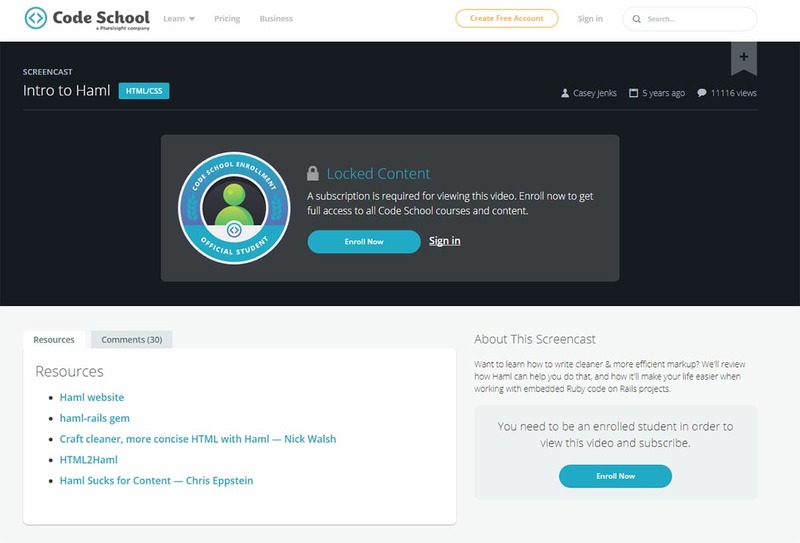 Another premium subscription site is Code School and they offer their own Intro To Haml screencast. This teaches you everything about the basic Ruby setup, how to compile your code, and how to simplify your life without coding an entire page manually. Just note the course does require a subscription to Code School so it’s also a premium resource. But if you subscribe you’ll get access to all their courses with one monthly fee, making it a great buy for anyone serious about advancing their web dev skillset across the board. The same can be said about the TutsPlus premium courses. With one monthly fee you get full access to the entire library of videos. I specifically recommend this course on tools for modern web development. You’ll only learn about Haml for a brief period since this course gets into many tools from Sass to Git and npm, all running over the terminal. But you’ll learn a lot from the course and with a Tuts+ account you’ll get full access to all of their premium courses. Many of them do focus on Ruby which often delves into the Haml world. Now for books, I can’t recommend too many. In regards to Haml there isn’t much in the way of print that’ll be better than free blog posts online. Both pretty detailed and focused primarily on Haml with Ruby. All of these learning resources should help you come to grips with Haml. It’s an incredible preprocessor for frontend coding and you don’t even need to use Ruby on your server to compile Haml pages. Try working through these learning materials on your own to see what you can pick up.